Regia Nation features broad stripes in some strong national flag colour combinations. Which team will you be knitting for? 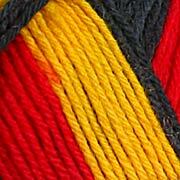 Our suggested needle sizes are 2-2.75mm for socks, 3-3.25mm for other projects.